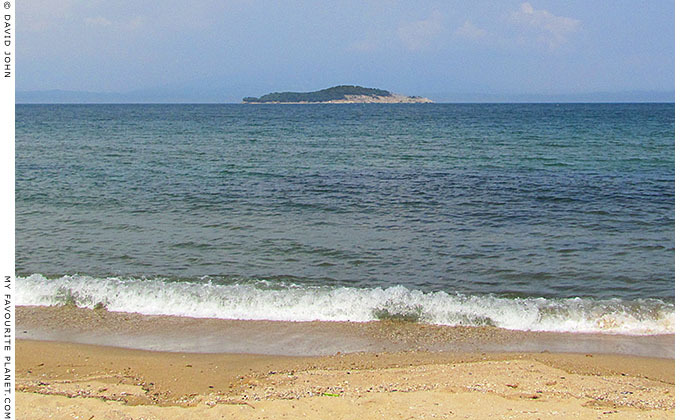 The uninhabited island Kafkanas (ancient Kapros) from Olympiada beach. The official name of uninhabited island across the bay, 2.5 km northwest of Olympiada, is Kavkanas (or Kafkanas; Greek, Καυκανάς). It is also known by its ancient name Kapros (also Capros or Caprus; Greek, Κάπρος, wild boar), which was also the name of the bay and Stageira's port, Kapros Limani. It was referred to by some scholars in the early 20th century as Kapronisi. According to legend, Olympias (also known as Olympiada) , the fourth wife of Philip II of Macedon and mother of Alexander the Great, was banished either to Stageira or the island of Kapros by Cassander, her rival for control of Macedonia, after he had defeated and captured her at Pydna in 316 BC. The village of Olympiada traces its name to this legend (see History of Stageira part 6). The age and significance of the name Kapros is not known. Greek colonists may have adopted the name given to the place by the previous tribal inhabitants of the area. Boars were a favourite hunting prey in ancient times, and myths and legends about boar hunts involving heroes and gods (e.g. Herakles, Meleager and Atalanta) were very popular in many cultures, including among the Greeks, Thracians and Celts (see photos below and on the next page). It has been suggested that in ancient cultures, the hunt of the boar (as also the lion and the bull), often represented in myth and art as a supernatural animal, symbolized a claim to territory and power. 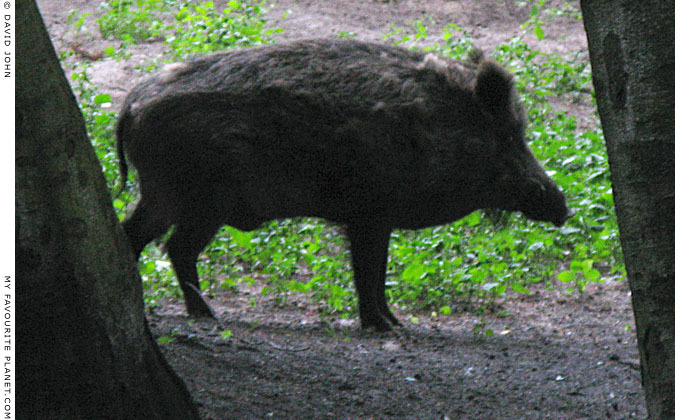 The boar was also a sacred animal in religious cults and was associated with deities such as Artemis and Apollo. Wild boar (Sus scrofa) is still abundant around Halkidiki, and is hunted in the Holomontas mountain area west of Stageira, where boar steaks are offered on restaurant menus (see photo below). 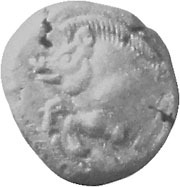 Stageira had its own mint and one of its coins shows a wild boar, while another, circa 520-500 BC, a boar being attacked by a lion . Many ancient Greek cities used canting puns on their names on coinage. Why the Stageirites would choose to mint money showing their own symbol being savaged by a lion is puzzling. Its sister city Akanthos similarly produced coins depicting a bull being attacked by a lion, and coins of Scione, another city in Halkidiki, showed a stag attacked by a lion. But how could such images have been considered good propaganda? Perhaps it symbolizes the colonists' victory over the land and/or its previous inhabitants. It has been suggested that the lion symbolizes Persia which conquered Halkidiki in 514 BC or shortly after (see Stageira history, part 4). Museum. Inv. No. MΘ 4304. The mythical hunt of the Kalydonian Boar. of more ancient Classical and Hellenistic sculpture. Thessaloniki Archaeological Museum. Inv. No. 1246. The complicated story of the hunt of the monstrous Kalydonian Boar (or Calydonian Boar; Greek, Καλυδώνιος Κάπρος, Kalydonios Kapros) features a Who's Who of Greek mythological characters, including Artemis, Meleager (the main hero of the myth), the Argonauts, Asklepios, Atalanta, Theseus and the Dioskouroi. The sculptor of this relief has borrowed figures and poses from earlier works of art. For example, compare the naked axe-wielding hunter on the left to the figure in the 4th century BC Stag Hunt mosaic in the Pella Archaeological Museum. Marble relief showing a boar hunt on horseback (five against one). Lycian sarcophagus from the Royal Necropolis of Sidon, Chamber No. 4. Parian marble. End of the 5th century BC. Istanbul Archaeological Museum. Inv. No. 369 T. Cat. Mendel 63. Olympias (Ὀλυμπιάς, circa 375-316 BC), also known as Olympiada (Ολυμπιάδα), was an Epirote princess, daughter of the Molossian king Neoptolemus I of Epirus (northwestern Greece). She married Philip in 357 BC. It is said that at the time she was known as Myrtale, and that she received the name Olympias after Philip's horse won at the Olympic Games in 356 BC, the same year as Alexander's birth. 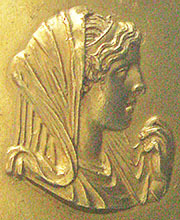 Olympias is depicted on the obverse of a gold medallion struck in the mid 3rd century AD, one of several found in Abukir, Egypt in 1902. The reverse side shows a Nereid, possibly Thetis, riding a sea monster, thought to be an allusion to Thetis as the mother of the Homeric hero Achilles, thus associating the mythological figures with Olympias and her son. Olympias' family, the Aeacidae, claimed descent from Neoptolemus, son of Achilles. These medallions were minted by Roman emperors as gifts for high-ranking officers and officials at the Alexandrian Olympic games, held in Macedonian cities such as Veria. See another Abukir medallion showing the head of Alexander the Great. Cassander (or Kassander; Greek, Κάσσανδρος Ἀντίπατρος, Kassandros Antipatros; circa 350-297 BC), was the son of Antipater, the regent in Macedonia during Alexander the Great's military campaign in Asia. He and Alexander had been fellow pupils of Aristotle, along with Hephaestion, Ptolemy and Leonnatus (see Olympiadas gallery page 5). Following Alexander's death in 323 BC, a bitter and bloody struggle for power broke out among his successors (his relatives and generals, known as the Diadochi). Cassander and Olympias became enemies, and he besieged her at Pydna, below Mount Olympus. Olympias finally surrendered in 316 BC after Cassander promised to spare her life, but he later had her tried and executed (see Stageira and Olympiadas history - Part 6). Cassander became King of Macedonia (305–297 BC), and founded the short-lived Antipatrid dynasty. He also founded the city of Thessalonike around 315 BC, naming it after his wife Thessalonike (Greek, Θεσσαλονίκη, Thessalian Victory), half sister of Alexander. Pausanias, Description of Greece, Book 9, Chapter 7, Section 2. At Perseus Digital Library. Diodorus Siculus, Library, Book XVII, chapter 118, section 2 and Book XIX, chapters 49-51, at Bill Thayer's LacusCurtius: Into the Roman World, University of Chicago. Marcus Junianus Justinus, Epitome of the Philippic History of Pompeius Trogus, Book XIV, chapter 6, at forumromanum.org. Polyaenus, Stragems of War, Book 4: Alexander's generals & others, chapter 11: Cassander, section 3. At websfor.org. Wild boar, hare and wildfowl on the menu of a restaurant in Polygyros, Halkidiki. Celebrating the boar: The Boar in Art History. Research by Michele Laing. University of Waterloo Library, Waterloo, Ontario, Canada. Coins from Stageira are very rare, and considered to be of excellent quality. 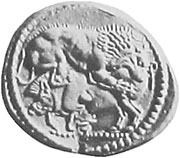 On 7th October 2009, an archaic silver tetradrachm minted at Stageira, showing a boar being attacked by a lion, sold at auction in Zurich, Switzerland for 120,000 Swiss francs.